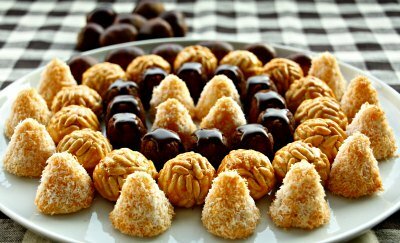 “Panellets” are a traditional sweet from Cataluña, prepared for “Dia de Todos los Santos” or All Saints Day and served with moscatel or “cava,” Spanish sparkling wine. It is made of equal parts ground almonds and sugar, formed into balls and decorated with pine nuts, rolled in cocoa powder, candied cherries or coconut flakes. They can also be flavored with coffee or cinnamon. The most popular type is the one rolled in pine nuts. Blanch almonds, then grind in food processor until almonds are a fine dust. Peel the potato and cut into quarters. Boil potato in a saucepan until cooked. Drain water and mash with a fork. Place sugar in a medium saucepan. Pour 1/2 cup water into the pan and stir to dissolve sugar. Add more water to completely dissolve sugar if necessary. Place on medium heat on stovetop and bring to a boil, stirring often. Add 3-4 drops of lemon juice. Reduce heat and simmer until mixture is a thick syrup. Remove saucepan from heat. Using a large wooden spoon, gradually stir in ground almonds, potato and grated lemon peel. Allow to cool to room temperature. Then, cover tightly and refrigerate overnight. Pre-heat oven to 380F degrees. Grease cookie sheets. Spoon out dough with a teaspoon. Roll dough into small balls in your palms. Then roll the balls in powdered cocoa or pine nuts. If using pine nuts, brush each with a bit of egg white. Place on greased cookie sheet. If you want to flavor the cookies, separate a portion of the dough and with your hands, work in a bit of instant coffee flakes, candied fruit or cinnamon. Then make individual balls. Bake cookies just long enough to brown the pine nuts - about 4 minutes. Using a spatula, remove immediately before cookies cool. Catalonia Recipes: As with nearly all cultures, Catalonian cooking has great character. Its innovative cooking often looking back to history for inspiration. 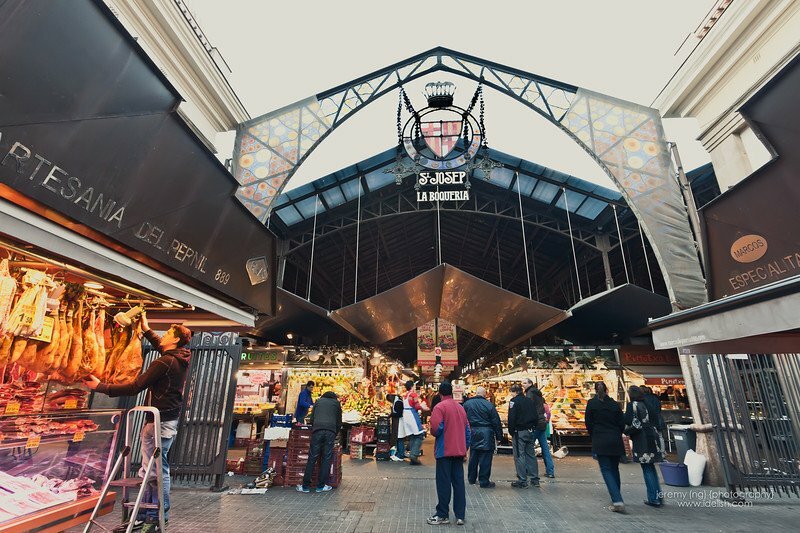 Although ultimately Mediterranean, Catalonia has been influenced by various cultures over the centuries: the Greeks, Romans, the Italians in the eighteenth century and the French have all left their mark on this complex cuisine. Catalonia has absorbed the best of each country and created a culinary package which forms part of the popular wisdom of the region.